The U.S. Route 66-Sixth Street Historic District comprises 13 blocks of commercial development in the San Jacinto Heights Addition west of Amarillo’s central business district. It runs along an east-west axis through a grid system of streets between Georgia and Forrest Avenues. Developed as an early 20th century streetcar suburb, the district was transformed by the establishment of a national transportation artery running through its center. The road was originally paved with gravel in 1921. Asphalt pavement on a concrete foundation replaced the gravel when the road became part of federally designated Route 66 in 1926. The commercial corridor was the first highway constructed to carry travelers out of Amarillo to the south and west. The U.S. Route 66-Sixth Street Historic District is Amarillo’s most intact collection of commercial buildings that possess significant associations with the highway. Featuring elements of Spanish Revival, Art Deco, and Art Moderne design, these buildings represent the historic development phases of this early 20th century suburb and the evolving tastes and sensibilities of American culture. The district is now a hub for nightlife and shopping, and the surrounding San Jacinto neighborhood remains a vibrant center of activity. Today, restaurants, antique stores, and specialty shops are housed in the rehabilitated storefronts. The district was added to the National Register of Historic Places in 1994. The 12 buildings described below represent many of the significant road trends that have shaped this district along historic Route 66 and provide an overview of the district’s character. The Natatorium (The Nat Ballroom). The Natatorium, better known as the Nat, is located at 604 South Georgia. Built in 1922 as an indoor swimming pool in a Gothic Revival style, the Natatorium faces West Sixth and acts as the visual gateway to the district. High turrets at the corners and a crenellated parapet ornament the two-story block clad in stucco veneer. An ample pointed arch marks the primary entrance, and windows and doors are set deep in the wall. Reflecting its nautical theme, the north side of the building around the corner is designed to look like an ocean-faring vessel replete with lifeboat-like elements near the roofline. The Nat was converted into a ballroom in 1926. The interior was redesigned in an Art Deco style adding some Art Deco ornamentation and neon lighting. The pool was covered by polished maple flooring giving space for a small stage and a dance floor on the first floor. The second floor was adapted with new sitting areas and private rooms. After hosting headliners like Tommy Dorsey and Duke Ellington, the Nat closed its doors in the 1960s. The adjoining Alamo Bar, which was built in 1935 and connects to the Nat by tunnel, is still open for business. Bussey Buildings. The Bussey Buildings are located at 2713-2727 West Sixth and were the first major commercial buildings in the district. Built in the late 1920s, the modest strip of commercial buildings consists of four storefronts with large glass display windows and dark brick with limestone detailing. The building’s most famous occupant was the San Jacinto Beauty School, which received Texas’ first beauty license. The beauty school occupied the store from 1941 to 1964. Cazzell Buildings. The Cazzell Buildings are located across the street from each other at 2806 and 2801 West Sixth. W.E. Cazzell purchased the one-story brick building at 2806 West Sixth in 1918 and operated a general store and post office. When he sold the building in 1922, he commissioned a new two-story one across the street. Borden’s Heap-O-Cream. Borden’s Heap-O-Cream at 3120 West Sixth is a one-story frame building with Art Moderne detailing such as oval plate glass windows, 3-lite wood double doors and a rounded metal awning on front and sides. Preservation Amarillo and the San Jacinto Boy Scout Troop rehabilitated the building in 1990. The grandson of the original sign painter provided plans to aid in replication of color, dimension, and style. Adkinson-Baker Tire Company. The Adkinson-Baker Tire Company is located at 3200 West Sixth. This service station was built in 1939 and is fronted by a projecting canopy over the pump island. The station originally housed the Adkinson-Baker Tire Co.#2 and exclusively sold Texaco gas. It was sold in 1945 and became the Theo A. Bippus Service Station. The Adkinson Baker Tire Company is one of three extant historic stations in the district and has been virtually unchanged since it opened in 1939. Carolina Building. A fine example of Spanish Colonial Revival architecture, the Caroline Building at 3313-23 West Sixth is divided by brick piers into eight, glass storefronts. 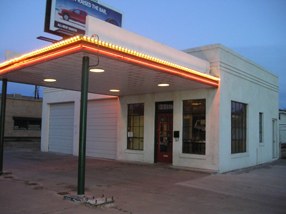 Built in 1926, it is one of the earliest examples of strip commercial buildings in Amarillo. Original occupants included an auto paint firm, a barbershop, beauty shop and a drug store. The red tile pent roof runs the length of the building and shades the store entrances and display windows. The parapet features cast concrete coping broken by several gables. Dutch Mill Service Station and Café. The Dutch Mill Service Station and Café has been in operation since 1932 at 3401 West Sixth. This seemingly plain looking building may fool visitors, but it has just as much character as some of the flashier places. The stuccoed walls are pierced by a glass paneled door, plate glass windows, and a roll down garage door. Ornamental crenellations grace the building, which originally featured a large Dutch windmill at its curbside to attract passing motorists. Until the 1950's this building housed both the service station and the café, which later expanded into the larger building at 3403 West Sixth. Taylor’s Texaco Station. Taylor’s Texaco Station is located at 3512 West Sixth. Built using the standard Texaco design developed by Walter D. Teauge in 1937, this one-story station clad in white porcelain has a projecting canopy over the pump island and also houses an office, two service bays, and restrooms. One of the first standardized gas station designs, the basic formula and red star motif provided instant recognition for the motorist in search of Texaco products. Martin’s Phillips 66 Station. Martin’s Phillips 66 Station at 3821 West Sixth operated from the 1930s to the 1990s. The earliest facility at this site included the corporation’s standard issue Tudor Revival style cottage, designed to blend in with a residential neighborhood. The building survived on the site until after construction of the current facility in 1963. Designed to catch the eye, its replacement exhibits exaggerated modernistic features including an office with canted plate glass walls, angled service bay entrances, and a soaring triangular canopy over the pump island. Herb Martin operated the station through all the changes in styles and marketing. Martin assisted many Route 66 travelers during the 1930s, giving gas to some and allowing those without money for lodging to spend the night at the station. Hubbell Duplex. Prominent local architect Guy Carlander designed the Hubbell Duplex at 3912 West Sixth in 1925 for Mr. and Mrs. Hubbell, who owned Hubbell Diamond T Truck Company. At the western end of one of Amarillo’s busiest streets, the house typifies the modest housing built during the city’s boom years. The dark brown brick dwelling features typical Craftsman details such as battered brick piers supporting the twin entry porticoes. The duplex remains virtually unchanged since its construction. San Jacinto Fire Station. Located at 610 South Georgia, the San Jacinto Fire Station was built in 1926 to serve the rapidly growing population of the San Jacinto area. The one-story brick building was designed in Mission Revival style with a red tile roof, battered walls and curvilinear parapets. The station served the neighborhood until 1975 and is the only surviving pre-World War II fire station in Amarillo. San Jacinto Methodist Church. Constructed in 1926, the San Jacinto Methodist Church is located at 505 South Tennessee. The church is a two-story, dark brown brick building with a pedimented entryway supported by square brick pilasters with a double limestone stringcourse below the cornice. The double entry doors sit below an arched stained glass transom. When Sixth Street was widened in 1924, the church lost its original entry stairway. The original concrete steps lead to Sixth Street and were flanked by a broad balustrade capped in cast stone. Today, the main entrance is on South Tennessee and flanked with pipe railings. The south façade of the church features four sets of paired wooden double hung, narrow stained glass windows, with two pairs of the same windows lighting the east and west sides of the entry. A large two-story brick building was added in the rear that houses the present sanctuary and educational facilities. The U.S Route 66-Sixth Street Historic District runs for 13 blocks along 6th St. between Georgia and Forrest Aves. west of downtown Amarillo, TX. Restaurants and antique stores line the street. The district hosts a number of festivals throughout the summer.